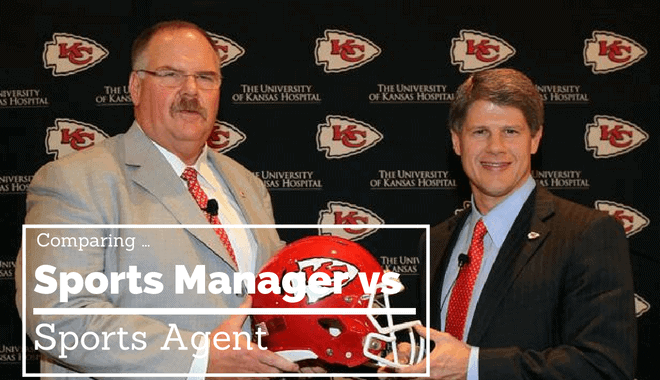 Sports Manager vs Agent: What's the Difference? Although the two terms are often used interchangeably, they are actually two separate professions, and each one has its own set of functions and duties. Both require different skill sets, but have similar educational backgrounds; however, both professions report high levels of job satisfaction. If you are considering becoming an agent or a manager, but aren’t certain what the differences are between the two, don’t worry. You aren’t alone! Sports managers must handle numerous responsibilities. Ultimately, the goal of a sports manager is to ensure that their client(s) can focus on winning without having to worry about the organization or business side of the sports industry. Managers focus on making sure that their clients receive the proper training and attention that will enable them to compete to the fullest of their abilities. The specific job duties of a sports manager will vary depending upon whether they are working for an individual athlete or a sports organization. A sports manager who works for an individual athlete is responsible for ensuring that they remain in peak physical and mental health. This may mean doing everything from soothing over issues between the player and a team to hiring the best personal trainers. The manager also acts as a sort of spokesperson for the athlete who has hired them. They work closely with the media to ensure that their client has a good public image and is receiving the recognition they deserve. On the other hand, a sports manager who works for an organization or a team has a different set of job functions. They oversee the entire network that is required for the team to operate efficiently, which includes keeping the ideal balance of employees. In addition to overseeing the inner workings of the organization, these sports managers must also soothe over any existing conflicts between the team, their managers, or their support personnel, and this includes acting as an intermediary between team owners and their players. They also work hand in hand with the marketing division to maintain a positive public image for the team. Most sports managers have a bachelor’s degree in the field of (or related to) sports management, and most go on to obtain graduate degrees. The primary difference between a sports agent and a sports manager is that a sports agent negotiates contracts on behalf of their clients. Sports agents often have multiple clients at one time. They often hammer out contracts between endorsers and athletes as well. When they are not specifically working on contracts, sports agents devote their time to promoting the value of their clients. Travel is often required, and many individuals find this time of work to be stressful due to the sheer amount of competition involved. Although a college degree is not technically required to work as a sports agent, many agents have graduate degrees in fields like sports management or business administration. It is not uncommon for sports agents to have law degrees. There are a number of internships available in this field, and sales experience is particularly valued, in addition to strong negotiation skills and excellent written and verbal communication skills. Most states require registration or licensure as a sports agent. Both professions offer exciting career choices, and if sports are one of your passions, then you can certainly exceed in either field. If you have strong organizational skills and interpersonal skills, then you might want to think about becoming a sports manager. If you have a keen sense of business and shrewd negotiating skills, then becoming a sports agent might be the right choice for you. Regardless of which option you choose, it will certainly be a fulfilling one.